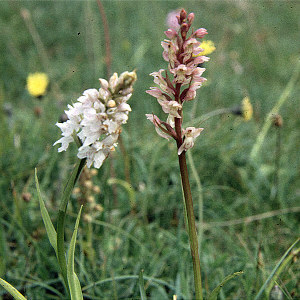 This is the hybrid between the Common Spotted-Orchid (Dactylorhiza fuchsii) and the Frog Orchid (Coeloglossum viride). It is rarely encountered but can occur where the two parent species grow close together. 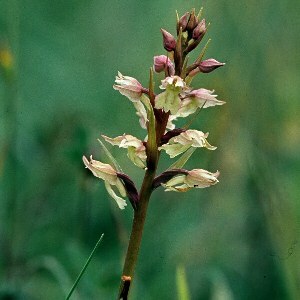 This hybrid has been found twice within the past thirty years at Killard Nature Reserve in Co Down, where the photographs were taken. 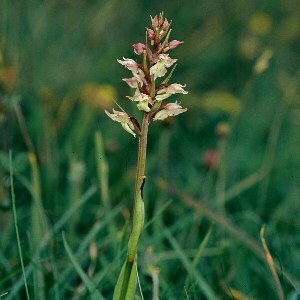 Like many hybrids, it varies greatly, showing a spectrum of variation from individuals which resemble Frog Orchid, through intermediate forms to plants which are more like Common Spotted-Orchid. 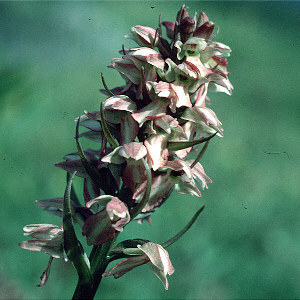 Like most hybrids, it is probably incapable of setting seed.